Adventure Time is full of adventurous times. The Land of Ooo doesn't seem to be capable or producing a "normal" day in the truest sense of the word, as it prefers days more in the madcap variety. KaBOOM! Studios does their best to chronicle those crazy days and their upcoming release of Adventure Time: Graybles Schmaybles in April gets a little crazier. Besides being the fifth in their Adventure Time original graphic novel series, the book also welcomes back Danielle Corsetto and Bridget Underwood. In Graybles Schmaybles, best buds Finn & Jake are about to go on their craziest adventure yet—and they don’t even have to leave their living room. The two pals discover a tiny cube all by its lonesome in the middle of the woods after helping Party God with his technical issues. Their commitment to never leaving the helpless finds their new friend back at the treehouse. Finn and Jake soon discover that some of the most harmless looking things can be the most dangerous. The Adventure Time Vol. 5: Graybles Schmaybles softcover arrives from KaBOOM! and Cartoon Network Enterprises in comic shops on April 1st with a cover illustrated by Stephanie Gonzaga for the price of $12.99 under Diamond order code FEB151177. The Final Order Cutoff deadline for retailers is March 9th. Full press release below. March 4, 2015 (Los Angeles, Calif.) - KaBOOM!, the award-winning all-ages imprint of publisher BOOM! 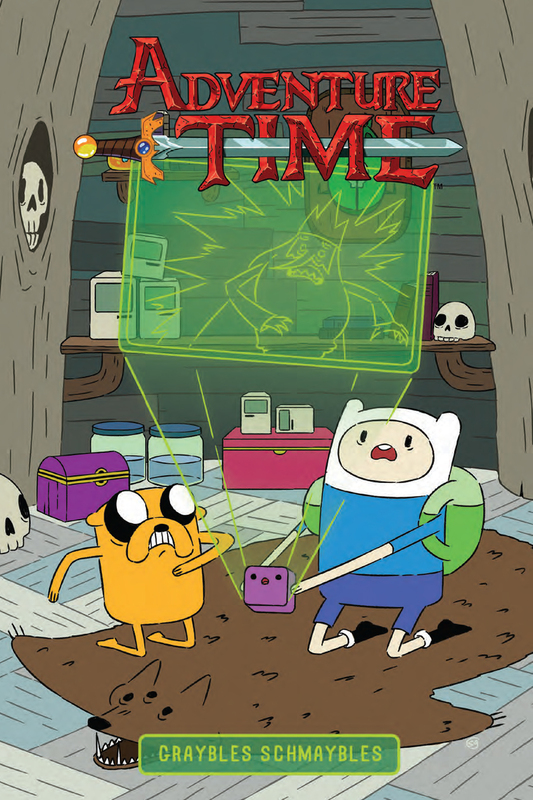 Studios, and Cartoon Network Enterprises, the licensing and merchandising arm of the network, are excited to announce the April debut of its fifth volume in the award-winning Adventure Time original graphic novel (OGN) series, Adventure Time Vol. 5: Graybles Schmaybles, presented in full color. Featuring 160 pages of adventure, as well as the franchise return of writer Danielle Corsetto and the debut of artist Bridget Underwood, Adventure Time Vol. 5: Graybles Schmaybles follows on the success of The New York Times bestselling books Adventure Time Vol. 1: Playing with Fire, Adventure Time Vol. 2: Pixel Princesses, Adventure Time Vol. 3: Seeing Red, and Adventure Time Vol. 4: Bitter Sweets. KaBOOM! 's award-winning Adventure Time comics are based on the hit Cartoon Network original series. From the mind of series creator Pendleton Ward and produced by Cartoon Network Studios, Adventure Time follows the unlikely heroes Finn and Jake, best buddies who traverse the mystical Land of Ooo and encounter its colorful inhabitants—and always find themselves in the middle of heart-pounding escapades. The Adventure Time Vol. 5: Graybles Schmaybles softcover arrives from KaBOOM! and Cartoon Network Enterprises in comic shops on April 1st with a cover illustrated by Stephanie Gonzaga (Adventure Time with Fionna and Cake) for the price of $12.99 under Diamond order code FEB151177. The Final Order Cutoff deadline for retailers is March 9th. Not sure where to find your nearest comic retailer? Use comicshoplocator.com or findacomicshop.com to find one! It’s also available for order directly from boom-studios.com.